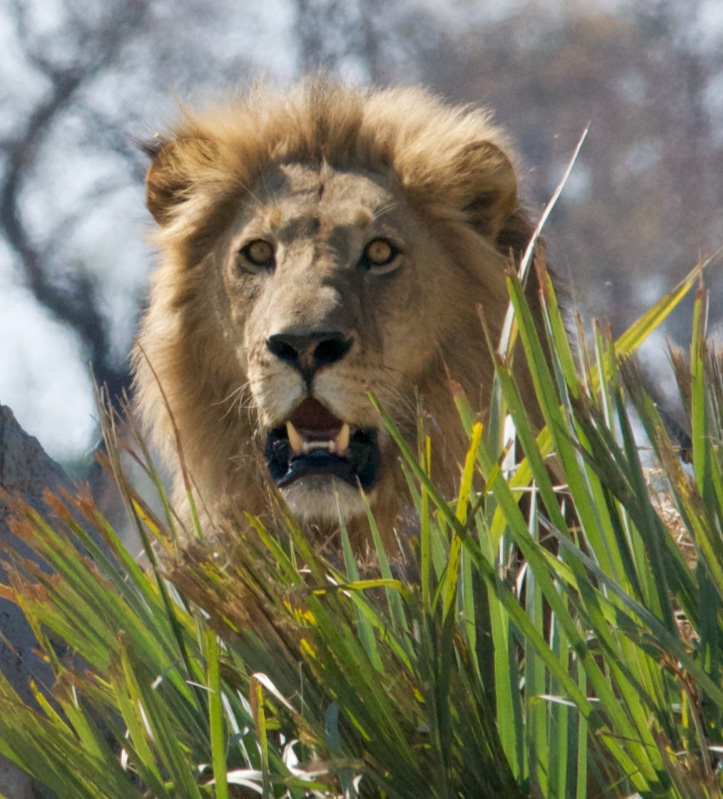 Part 2: The Lion of Judah – A Lion Has Roared! We know that symbolically Jesus was represented by the Passover lamb. And we know that He was indeed our sacrificial lamb that removed our sin. But where does this reference to a Lion come from? It begins with an ancient prophecy. On his death-bed, the patriarch Jacob reached out to his sons and bestowed a blessing on each of them. His blessing on Judah holds a profound prophecy about Messiah. At first it appears that Jacob is speaking directly to his son. But then Jacob begins to speak with a prophetic voice. Judah is called a lion’s whelp (or cub). Judah will hold the scepter and keep the lawgiver between his feet. That scepter will pass to Shiloh. Once Shiloh comes, then the people will gather to Him. He binds his donkey to the vine and the donkey’s colt to the choice vine. His garments are red, dipped in the blood of grapes. His eyes are darker than wine and his teeth whiter than milk. Since the time of Jacob’s blessing on Judah, the tribe has always been represented as a lion. The lion appeared on banners or standards held high before the camp as it marched. If not actually so at the time, this is how future artists portrayed their march. 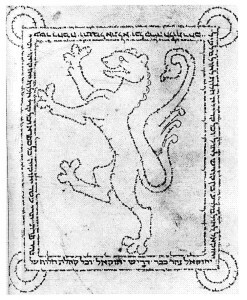 Lions are prevalent throughout Jewish art as representing the tribe of Judah. Lions often appear beside the tables of the Law. Take some time to look at Jewish art. It is filled with lions, rampant lions (or standing lions) and eagles. The lions represent Judah as the one who upholds the Law. You will especially see lions guarding the Ten Commandments, the Stone Tables and the Torah scrolls. This page is from a Jewish coloring book and represents Simhat Torah, or the celebration that comes at the end of the Feast of Tabernacles. Simhat Torah means “rejoicing in the law.” The Rabbis are carrying Torah scrolls and the children are waving flags with the Tables of Stone pictured. 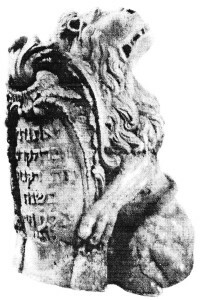 Notice the two rampant lions guarding the Tables of Stone at the top of the Torah cabinet. Remember the verse? 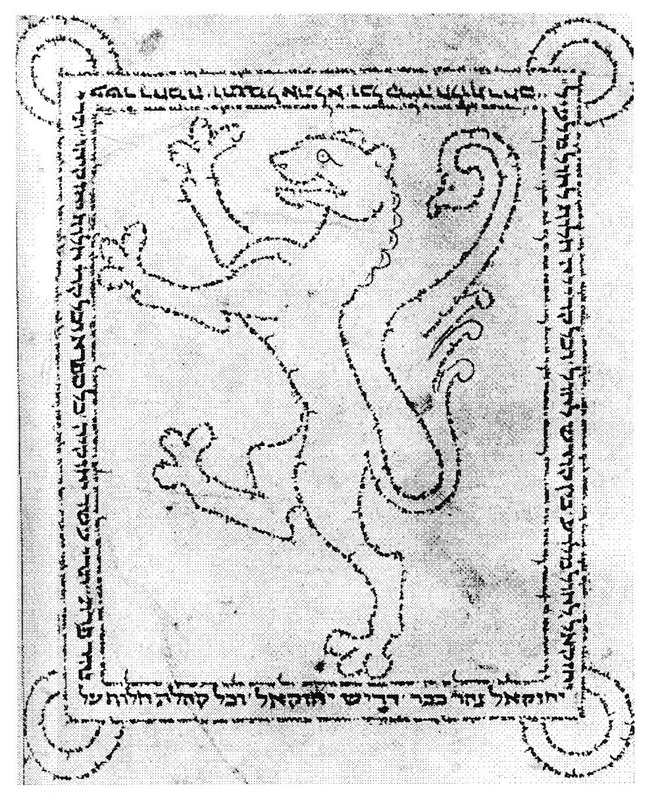 “The scepter will not depart from Judah, nor a lawgiver from between his feet until Shiloh comes.” Here is a Simhat Torah flag showing two lions holding the Torah beneath a crown. An introductory page to the book of Ezekiel. 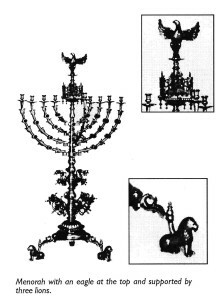 Lions as the feet of a menorah. Lion on a tombstone, probably for a Rabbi. Eventually the lions become scrollwork. Once we know this, we see even more lions in decorative art. 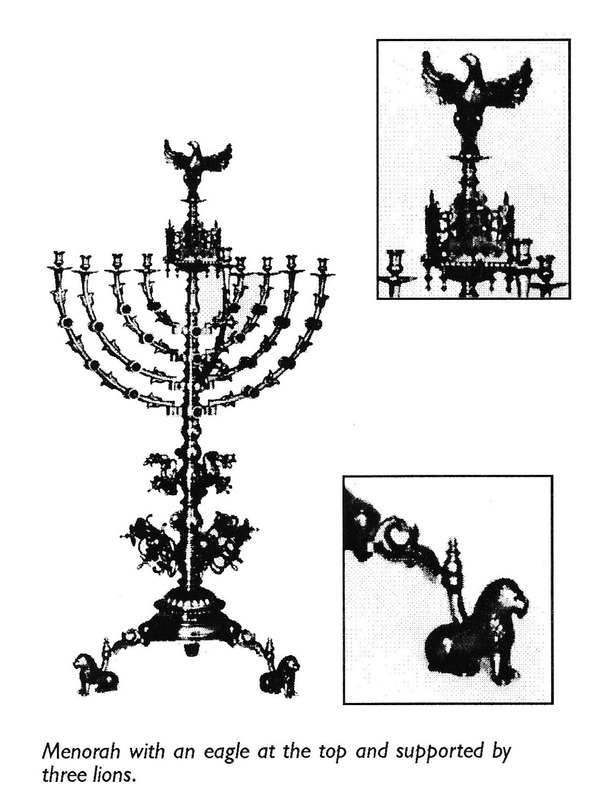 A Menorah. The rampant lions are becoming more stylized. There are other references in Scripture relating to the donkey and her colt. All of them relate to Jesus on the triumphal day when He rode into Jerusalem amid palm fronds waving and shouts of Hosanna! At first we think that this man who comes from Edom is some kind of nobleman since he is “travelling in the greatness of his strength” and is “glorious in his apparel.” But then we see that his dyed garments resemble someone who was trampling the grapes in a wine vat. Once we begin to see that this text is speaking about Christ, these two opposing pictures begin to make sense: one who is great and glorious and one whose garments have been stained in a wine press. Both Edom and Bozrah are just figurative speech. The real importance of these verses is the fact that this Man who declares His name to be “I Who Speak in Righteousness, Mighty to Save” looked around and saw that there was no one else to bring salvation to the world. So His own arm brought salvation. This is a work that He alone could do. Then He says, “Their blood is sprinkled on My garments, and I have stained all My robes.” Now we know that this red dye that resembles the juice of grapes is actually “their blood.” The priests in the temple would sprinkle the blood of the sacrifice onto their robes in a symbolic gesture of taking the sin onto themselves. These filthy garments that have been stained with the blood of grapes represent Jesus who has borne our sins so that we can be free of sin and live. When we read in Genesis that He “washed his . . . robes in the blood of grapes,” we are seeing another prophetic symbol of the Messiah who has carried our sins on His person to the Cross. If you were to continue reading in Isaiah 63, you would also see that He treads the winepress in anger and fury. This is because He will wipe out and tread down all sin. For those people who refuse to give up their sin, they will be trampled along with their cherished sin in the end. You can learn more about these filthy garments when you read about Joshua standing before the Angel in Zechariah 3 and in Part 4: War! As you read the passage in Genesis 49, when did you start to notice that this might be a prophecy of Messiah? You should have known for sure that these verses were pointing forward when you came to the word “Shiloh.” Since ancient times, it has always been known that Shiloh refers to the Messiah. This word “Shiloh,” Strong’s number H7886, appears only once in the Bible. The city of “Shiloh” is a different word—a different Strong’s number H7887. The Old Testament affirms this prophecy is for all the people, not just the nation of Israel. 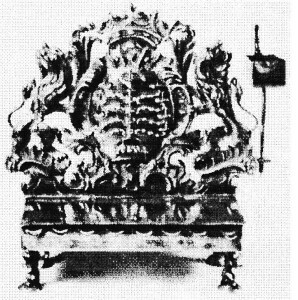 “The scepter was a symbol of regal command. In ancient times it was a staff which the king held in his hand when he spoke in public assemblies. When he sat upon his throne, the king rested the scepter between his feet. “Now therefore, thus shall you say to My servant David, thus says the LORD of hosts: ‘I took you from the sheepfold, from following the sheep, to be ruler over My people, over Israel…. “I have found My servant David; with My holy oil I have anointed him…. My mercy I will keep for him forever, and My covenant shall stand firm with him. His seed also I will make to endure forever, and his throne as the days of heaven…. My covenant I will not break, nor alter the word that has gone out of My lips. “There shall come forth a Rod from the stem of Jesse, and a Branch shall grow out of his roots. The Spirit of the Lord shall rest upon Him…. Genesis 49 says that Judah would hold the scepter. This promise was passed on to David and then on to Messiah. This is the gospel, or “good news,” of the kingdom that Christ spoke of in Matthew 24:14. This will be the final message that goes out to the world. “Now I saw heaven opened, and behold, a white horse. And He who sat on him was called Faithful and True, and in righteousness He judges and makes war. “His eyes were like a flame of fire, and on His head were many crowns. He had a name written that no one knew except Himself. “He was clothed with a robe dipped in blood, and His name is called The Word of God…. “Now out of His mouth goes a sharp sword, that with it He should strike the nations. And He Himself will rule them with a rod of iron. Judah will rule until the Scepter passes to Shiloh—The Messiah. God promised David that his scepter of rule would last forever through his Seed. Jesus was born from the Tribe of Judah through the lineage of David. Judah was the Lion until Christ fulfilled the purpose of the tribe by becoming the Lion who came out of the Tribe of Judah. Jesus took on the form of humanity, becoming a brother to all mankind. In this form He is able to redeem us and be our King. Jesus stained His garments red in our blood by taking on our sins. Jesus rode triumphantly into Jerusalem on the colt of a donkey. By His humanity, He is able to gather all people together and reunite them with His Father. By His sinless life, His death and His resurrection, He has earned the right to unseal the scroll that will lead to the Kingdom. Back in the Throne Room of Revelation 5, God gave us a view of Christ’s inauguration in Heaven. This Throne Room scene happened shortly after the Cross when Christ had fulfilled the role of becoming the Messiah that Judah had long been hoping for. Having taken on our human bloodline, the Son of Man can claim the right to buy back our freedom. Having taken on the bloodline of Judah, Shiloh can take the scepter from Judah. And now Jesus, the son of David, is seated on His throne in the Heavenly courts. No Kingdom, Yet . . . In Revelation 5 we see Christ’s inauguration into heaven. A new song is sung and a new level of worship is begun. But He has not yet received the kingdom. And so, with this goal in sight, Jesus goes forth conquering. . . .
At the Cross Jesus died as the Lamb. At His inauguration in Heaven He stood as the Lion of the Tribe of Judah. Now, riding on the white horse, the bow showing that He is a warrior, Jesus still has a work to accomplish. Each act of opening the Seals on the Scroll will bring Him closer to His reward of the Kingdom.